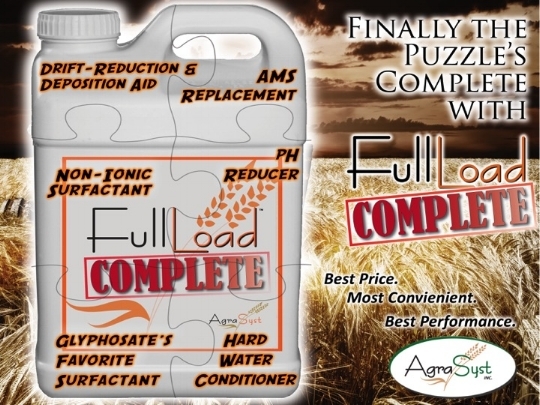 Full Load Complete gives you superior efficacy of glyphosate herbicides as well as most post applied salt formulated herbicides such as 2,4-D, Glufosinate and Dicamba. It has the best drift reduction technology plus a great deposition profile. Full Load Complete also reduces volatile of phenoxy herbicides by up to 40%. It replaces AMS, counteracts hard water, and is designed to perform with all tank mixtures. Full Load Complete is an entirely new way of doing things. AgraSyst has taken the efficacy improvement capabilities of Full Load and combined it in a single formulation that has built in drift reduction and volatility reduction. However, we never forget that the number one reason to add an adjuvant to your spray tank is to improve efficacy. That is what Full Load Complete does best. Makes your Herbicides work as best they can. The new double staked genes for 2,4-D and Dicamba tolerance in corn, cotton and soybeans have highlighted the off target movement potential of herbicides. Full Load Complete is patented technology that combines exception efficacy improvement with exceptional off target movement profile. The label situation with dicamba tolerant crops: Full Load Complete was designed and built to create spray droplets in the size range of 200 to 500 microns. This is the most efficacious way to spray most post applied herbicides including glyphosate, dicamba and 2,4-D. The EPA requirements on the XtendiMAX labels require the use of spray nozzles that produce very large spray droplets. The mathematical model used to determine these label requirements exclude the drift portion of Full Load Complete. So it must be applied with and approved Drift Reduction Agent (DRA). Older formulations of dicamba do not have these label restrictions. All tank mixtures of XtendiMAX + glyphosate based herbicide also require an approved DRA (Drift Reduction Agent). Full Load Complete is an excellent AMS replacement adjuvant for tank mixtures using XtendiMAX plus PowerMAX or XtendiMAX plus any glyphosate herbicide that requires an approved DRA.